Pictured above is the SOAR session hosted June 23 for transfer students. 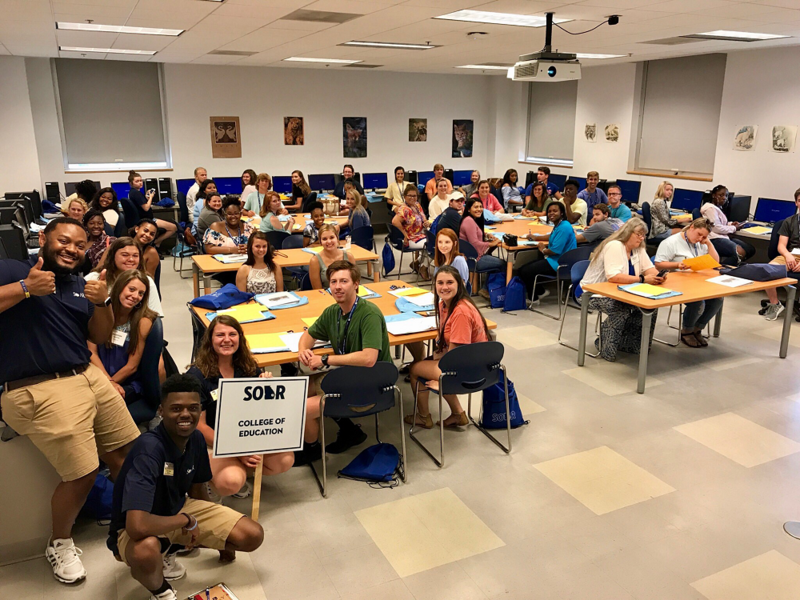 The College of Education (COE) recently hosted 52 transfer students during Georgia Southern University’s transfer student orientation. The largest group of transfer students that the College has seen since 2010, COE’s Student Success Center Director, Chris Thompson, says that recruiting the transfer population takes steady years of work. Orientation sessions, called SOAR (Southern’s Orientation, Advisement and Registration), are the next step for students who have been accepted and plan to attend Georgia Southern. While at orientation, students are provided with a wealth of information about the University–from meal plans to student organization–as well as details about their chosen majors and courses they will need to enroll in for their first semester. Each year, Georgia Southern hosts 13 SOAR sessions, including two specific sessions for transfer students. So far, the College of Education advisors have hosted 156 students at orientation sessions this year. With six SOAR sessions remaining for the year, Thompson said the numbers for incoming students in 2017 is anticipated to exceed 200. Students pursuing undergraduate degrees in the College of Education can pursue five bachelor’s of science in education degree options including: early childhood education; health and physical education; middle grades education; secondary education and special education. Secondary Education returned as an option for undergraduate students starting this fall, and will offer concentrations in mathematics, biology, chemistry and physics.